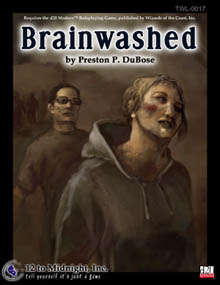 Brainwashed is a d20 Modern, horror adventure by 12 to Midnight, written by the impressively named Preston P. DuBose and illustrated by Nicole Cardiff (cover) and Steve Bentley (interior). It follows the misadventures of a group of investigators as they probe the mysterious and sudden popularity of the Harmony Farm commune/cult and get to the bottom of a strange and otherworldly secret. 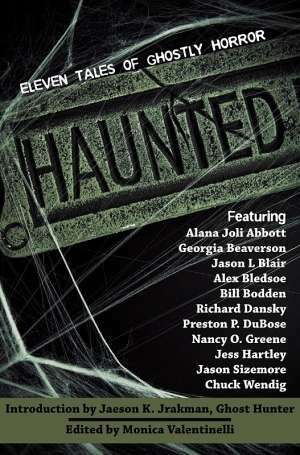 The blurb professes an ambition for a Lovecraftian feel to the game, good to aim high, and it references 12 to Midnight’s horror supplemental rules effort Fear Effects, which – unfortunately – I haven’t read, so I can’t comment on the adventure in that respect. 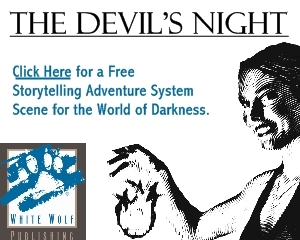 I also now, ahead of time and with full understanding of my own hypocrisy here, having written published adventures before, admit that I just generally don’t like pre-written adventures as they don’t suit my free-wheeling style of GMing. The Harmony Farm has existed in peaceful obscurity since the end of the sixties, home to a constant drift of weirdos, freaks, the mentally impaired, the poor and die-hard hippies. Over all that time it’s managed to just keep ticking along as a farm, able to keep the roof together, just about, and provide shelter for its weird and constantly shifting community. All that changes after a strange earth tremor and the discovery of a strange and fascinating object on the farm’s land. Suddenly most of the people in the farm are entranced by the object and start to recruit – successfully – from further afield, including the nearest college campus. I won’t say too much more for fear of giving it all away for people who want to play it, but the heroes get to encounter some strange things and to save an awful lot of people from a grisly fate as well as uncovering one possible cause of cattle mutilations, and what more do you want really? The layout is basic but clean and crisp, the only niggle there is the tiny font used in the tables which makes them hard to read on a 15/17 inch monitor even at full screen resolution and the font used for the titles of the sections and subsections which is verytallandnarrowandendsupcrushedalltogetherinonespot which makes it hard to read. The cover is a capable painted cover and the artist has done a spot of work for the bigger studios as well, it’s a little lopsided and odd – particularly the female figure – but that seems appropriate enough to me for a horror work and is probably deliberate. The interior art is scant, CAD maps that are useful enough but which detract a little for the atmosphere of the scenario if you use them as handouts and undermine some of the fine work done by the scrawled note handout, which is a lot better. The black and white pieces, of which there are two, are very good, one reminding one a little uncomfortably of the Japanese ‘vore’ fetish (don’t ask) and the other suitably weird and Lovecraftian. The writing is capable and keen, just what you need for such an adventure, not too much faffing around and not great screeds of overly flowery prose. It does get overindulgent in one or two spots but for the most part it, thankfully, errs on the side of caution – for which I’m grateful. Does it fulfil its lofty Lovecraftian target though? I don’t think so, the inclusion of tinfoil hats in the scenario – repeatedly – doesn’t so much inject a note of contrasting humour as it detracts from the atmosphere of the scenario overall and, while the scenario’s antagonist does conform to some Lovecraftian tales it doesn’t fulfil quite what people expect from a Lovecraftian tale, it’s more Roswell than The Shadow out of Time. You’re already handicapped in trying to run a horror game with d20. It’s like trying to do the Paris-Dakar rally in a Citroen 2CV. The base mechanics simply aren’t up to the task, even with the greater propensity for death in d20 Modern. I don’t know the Fear Effects rules personally, but unless they achieve something of absolutely unprecedented brilliance that’s like fitting a spoiler and UV underlighting to the aforementioned 2CV. It doesn’t actually solve the essential problem that the underlying car is crap for the job at hand. * Easily adaptable to other systems. * Fits within an evening’s play. * Has everything you need – including handouts. * d20 is rubbish at horror. * A ‘short version’ of Fear Effects or a description thereof would have helped make sense of the text, and possibly encouraged a purchase. * More interior artwork to the standard of the B&W pieces would have been helpful.